The trust fund is just an accounting fiction — a pile of worthless IOUs! Generations of voters have been misled by such skillfully-wrought presentations. ….Krugman is our most valuable player by far — our only player at the top of the press corps. Can he disentangle the trust fund scam in a way average people will understand? We don’t know, and it isn’t his job; no player should be expected to carry the ball on every play from scrimmage. Tomorrow, we’ll offer our own ideas at how the “there-is-no-trust-fund nonsense” might best be approached, in a way average people can follow. Well, hell, I’ll take a crack at it. Here’s the simple version. This might have been a squirrelly deal to make. But it doesn’t matter. It’s the deal we made. And it’s obviously unfair to change it halfway through. income taxes, which mostly means the well-off and the rich. For nearly 30 years, Group A has been overpaying payroll taxes, and that’s allowed the government to lower income tax rates. The implicit promise of the 1983 deal is that sometime in the next few years, this is going to flip. Group A will begin underpaying payroll taxes, and the rich, who have reaped the benefits of their overpayment for 30 years, will make good on their half of the deal by paying higher income tax rates to make up the difference. The physical embodiment of this deal is the Social Security trust fund. Group A overpaid and built up a pile of bonds in the trust fund. Those bonds are a promise by Group B to repay the money. That promise is going to start coming due in a few years, and it’s hardly surprising that Group B isn’t as excited about the deal now as it was in 1983. It’s never as much fun paying off a loan as it is to spend the money in the first place. But pay it off they must. 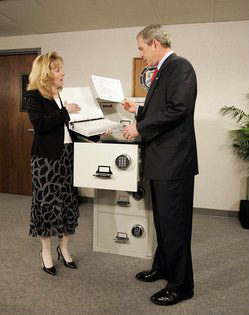 The rich have been getting a loan from the middle class for decades, and the loan papers are the Social Security trust fund bonds that George W. Bush is admiring in the photograph above. Anybody who claims the trust fund is a myth is basically saying it’s OK for the rich to renege on that loan. But surely no one would ever say such a thing. Right? POSTSCRIPT: Still not simple enough? Help out in comments! How can we make this explanation even easier to follow without losing the basic accuracy of the story? Suggestions welcome.